Glasshouse Walk (formerly Glasshouse Street), just off the Albert Embankment, is now the only reminder that the glass making industry was once an internationally important industry in Vauxhall. The Venetians protected their technology very successfully, including when working abroad, and grew rich on its proceeds. But foreigners began to challenge Italian dominance through various innovations from the 1600s onwards. For instance, a British patent was granted to Sir W Slingsby in 1610 for burning coal instead of wood in glass furnaces. The use of wood was then made illegal in England and, in 1617, Sir Richard Mansel acquired the sole rights for making glass throughout the country. Most monopoly rights and patents lapsed during Oliver Cromwell’s Protectorate (1649-1660) but, in 1663, the Duke of Buckingham, although unable to obtain a renewal of the monopoly, secured a ban on the importation of much specialised glass, thus paving the way for his own investment in glass-making in Vauxhall (1670) and Greenwich. 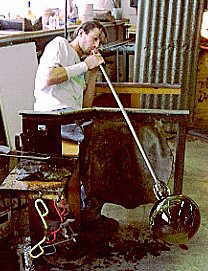 Buckingham’s glassworks employed Venetian craftsmen to make mirror glass up to about 1 metre long, and the works continued to make glass until around 1780. In the meantime, other glasshouses faced increasing competition from another innovation, lead crystal (“flint glass”), which was developed by the English glassmaker George Ravenscroft in the 1670s by substituting lead oxide for part of the potash then used to make high quality glass, and Buckingham’s Greenwich glass house was forced to close soon afterwards. Further up river, however, another glassmaker John Bellingham returned from Holland to begin making “Dutch” lead glass in Vauxhall in 1671, initially in partnership with, and soon in separate premises from Buckingham. Why Vauxhall? In part, this was because the fumes from glass works were highly polluting and so glassmaking was prohibited anywhere near the City of London. Also, the nearby river was also very useful for transporting coal and sand to the works. Buckingham, by the way, was quite a character. He was a royalist who benefitted after the restoration from his prior support for Charles II. And he favoured religious toleration, earning the respect of William Penn, the Quaker who went on to found Pennsylvania. His highs included being reputedly King Charles II’s richest subject and later being appointed Chief Minister and then Chancellor of Cambridge and High Steward of Oxford Universities. His lows, however, were many. He was imprisoned in the Tower of London at least twice and his tenure of high office was said to be chiefly marked by scandals and intrigues. He left children, but none of them were legitimate so his title died with him.